You may know this already but I'll recap a little for those who don't... 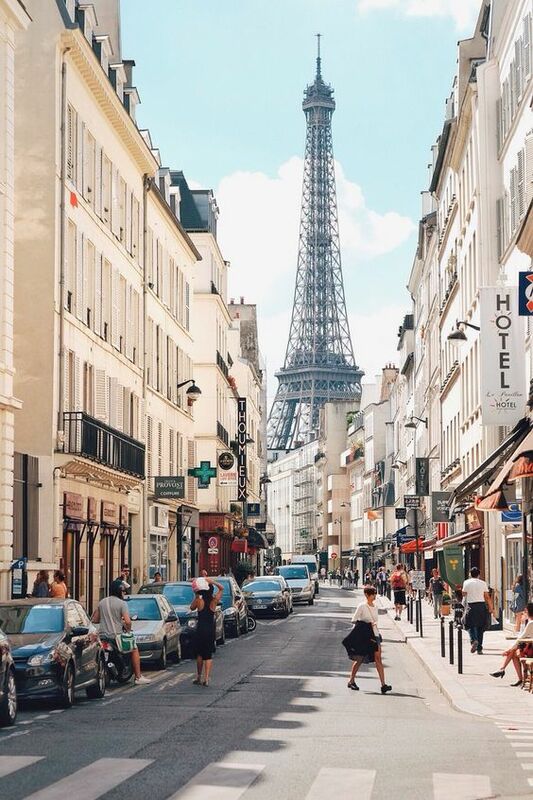 I'm headed to Paris and London in September with my family. The group of us who are going includes my parents, my brother, his fiancé and my husband. I've been to London, probably 20 years ago now so I'm excited to see the city as an adult and I have never been to Paris. As a family we are working on an itinerary full of spots we'd like to visit, sights we'd like to see and where we're headed for dinner. We already have reservations at 6 restaurants! I know, sorta crazy, we like to eat. I am also outfit planning. Since we will be out and about all day I plan on wearing two outfits a day. Mostly dresses for dinner and put together street style outfits for the day. I have been using Pinterest as my go-to for outfit inspiration and have created two boards, Paris Style Inspo and London Style. Today I am sharing outfits I have found on Pinterest and how I plan to recreate them. I am almost positive this image is of Kayla from Not Your Standard. Her style is amazing! I don't own any of the pieces of this look except for my Daniel Wellington watch and a couple gold necklaces. So here is what I'm shopping for this look; tee, skirt and sneakers or maybe these espadrilles which I already own. 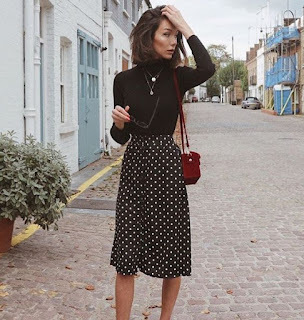 I love these looks because I am a lover of polka dots and already own all the pieces I need to recreate these looks, remember this outfit post? 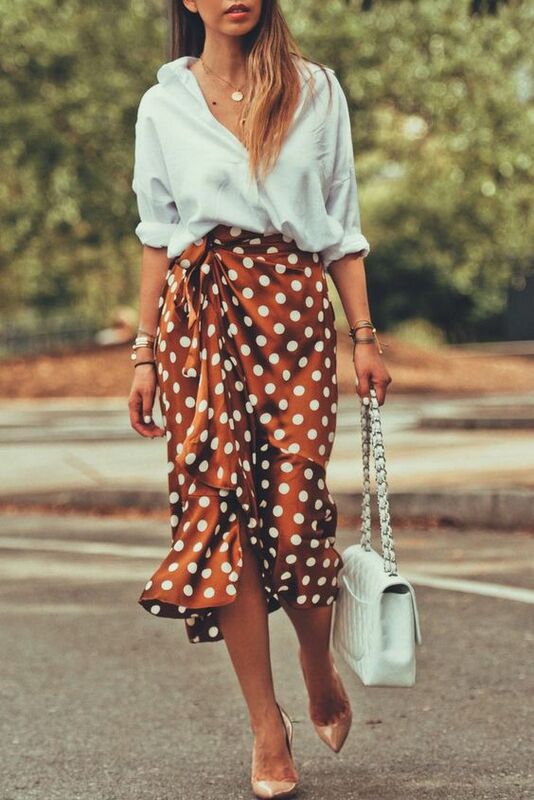 Skirt, tee, watch, bag and loafers. But I might switch out the loafers for these block heels I just purchased the other day. 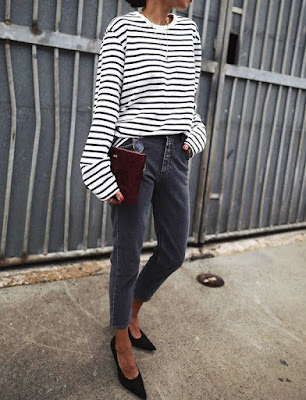 In my opinion, a simple striped top is a quintessential Parisian look. I can't decide if I'll wear a pair or black pants or grey jeans with my striped top. I'm leaning towards grey like these mom jeans or these skinnies with my new block heels and this bag. For the most part, the couple of bags/ purses that I am planning to pack are larger because I'll be toting around our camera and maybe a backup lens. To recreate these looks I might bring along this white dress which you might remember from this post. Even though I love that dress I think a shorter length might be more flattering for the trip and I'm really loving this dress in pink. Either way I'll pair my dress with this bag and either this or this hat and these espadrilles. This look is all about planning an outfit around these Chanel-like shoes, which aren't even pictured in these photos. Sorry. 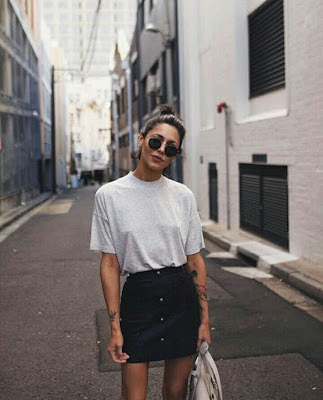 I already own this jean skirt but lately it's a little large on me so I might purchase this black jean skirt by Top Shop whose clothes run smaller and hopefully it will be a bit more fitted. As for the top I have a long sleeved v-neck bodysuit in both black and white, similar to this one. I'm leaning towards an all black look with this GG belt. If the black Top Shop skirt is really fitted I might just go with a simple tee like this one. As for my dinner dresses, I plan on packing this polka dot number, my favorite gingham dress (which I wear at least once a week) and an of the shoulder ruffle dress that I purchased years ago similar to this one. With all of these dresses I will be wearing my block heels. Is it crazy that I already have a good idea of what I want to pack? I'm a little crazy, fashion crazy and I'm a very organized person. I love to imagine these outfits in the streets of Paris, it really excites me. That and all the croissants and cheese I will eat and all the red wine that I will drink with a big 'ol grin on my face. I'll be back again soon with my pinning outfit plans for London. Girl you and me both! I have never been and am dying to! I can't wait! I'll be sure to post a ton of photos here and on Instagram. Thank for stopping by Leah! What time in September are you going? I'm going in mid to late September and am afraid it might be too chilly for this sort of style!